I took three of my kids to the dentist this week- the normal every 6 months habit. We walked into the waiting room, books in hand. (Aside: I really believe if I bring my book, my wait is less. If I forget my book, the wait is longer. It is like a Murphy’s Law for me!) The television had been playing to an empty room, and was set to a morning talk show. A commercial came on with a famous female commentator asking a woman, “Did you kiss her? Did you like it?” I had no idea what was coming, but I quickly jumped up to turn off the television. When I spun to look at my kids, they were all three looking down at their books. Phew! One more day without that media educating my children’s morals… I think. The silence was refreshing, when an employee sprang into the room, remote in hand. “Oh sorry! Here, let me put it on a kids’ channel.” And with all good intentions, she made the noise begin again, this time with cartoons flying. From the waiting room, we went to the dentist chairs, where we each had our own personal TV. Mine was set on one of those “insider” shows that tells all of the gossip about famous people. I quietly prayed for my children’s ears…and for the actor about whom they were talking on my TV – who was in trouble for protecting his own children from his paparazzi. After my appointment, I went to the waiting room, where my children were. Their books were open, while the television continued in the background. The receptionist asked, “How do you get them to do that?” as if it were taught as a dog-trick, like playing dead. HOW DO YOU GET KIDS TO READ? You might remember these words from a previous letter: “Casey, our oldest, was quite a natural reader. He was reading well by the time he was 5. Now, both boys and their younger siblings really enjoy reading. I can’t even pretend to know all of the answers to the question, “How do you get kids to read?” but I thought I would write down some of the things that, by the grace of God, seemed to help them develop into readers. I humbly hope that it helps others grow bookworms in their own homes as well. A list of book suggestions was provided in a previous letter. – Model reading for them. Children learn best by example. What you do speaks much more loudly than what you tell them to do. Chris and Christine, reading side-by-side on an airplane. – Read aloud to them. We were blessed to hear that advice when our children were babies, so we have been reading aloud to them since before they could speak. Even though they are all independent readers now, we still try to read several books a year as a family. We finished Best Christmas Pageant Ever last week (OK- that one was really for ME! I laugh and cry!) and right now are in Dickens’ A Christmas Carol, as part of our traditions. We try to read aloud the Bible stories daily- as listed in the back of Thomas Jefferson Education. When I read The Hiding Place about Corrie Ten Boom’s efforts of saving Jews during Nazi occupation, and her own time in the concentration camp, something that really stuck with me was that her father spent time every night reading aloud to the family- and she was in her thirties! – Library trips: We aim for minimally every 3 weeks, and they may each get ten books, which they are “supposed” to keep in their library book bag. Yes, that is 40 borrowed books. There have been MANY times that I have literally set the timer on my phone for 15 minutes. We disperse and meet at checkout when the timer goes off. I figure 15 minutes is better than nothing! We recently found our church’s library has a fantastic selection of “pre-approved” series for youth. – Used-book stores. Wow! This gold-digging began as Chris trying to help me out when I had babies, but it has become almost a “rite of passage” to be old enough (and a good enough reader) to go to the used-book store with Dad. – Popcorn and hot chocolate. Yep food always gets me. Last summer, when it was 87 degrees here in North Carolina, my 7-yr-old daughter said, “Can we light the fire and pop some popcorn?” She has happy memories of our reading times in front of the fire! She had forgotten that those were in the Michigan winter! At our former home, we actually had a popcorn oil “fog” on the carpet in front of the fireplace, from the number of times we had taken our book bags by the fire. – Family reading night. You’ve heard of family game night, family movie night, why not family reading night?! 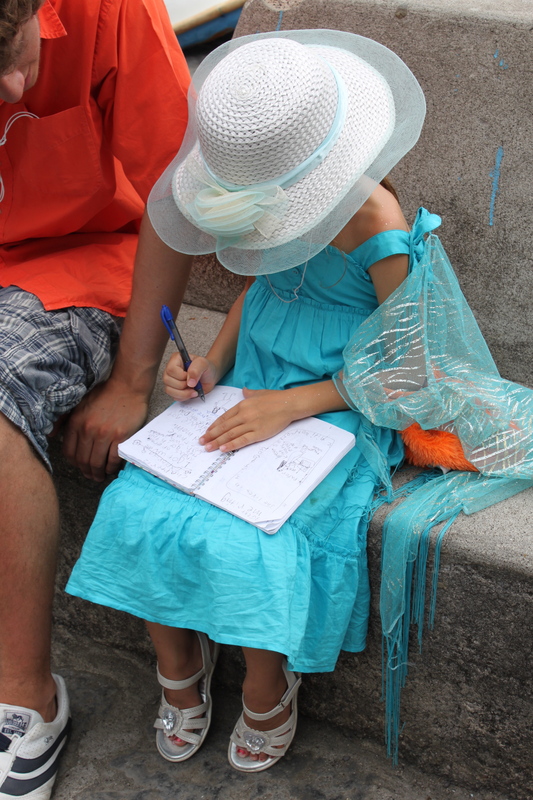 Christine in her "travel gear," journaling. – Book journals: This one goes in and out of our life. We just forget to write things down. 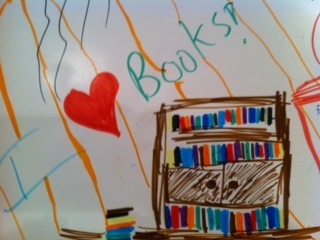 Right now, Christine (8) has a poster that she has made, keeping track of the books she is reading. – Start a Parent/Child Book Discussion: Whether it is just you and your child(ren) or you invite other families to join you, reading a book and discussing it is fun and will draw you and your children together. I am always shocked…always…at the different ways my children see the book. – Reward with Books/Reading Time: Treat it like dessert, and they will see it as dessert. Treat is like it’s a chore, and they will act like it. Give books as gifts, or rewards. The “trip to the library” is actually a coupon my kids can get for an A+ math test in our homeschool. Some nights, we say prayers and they go to bed, but they can read until _:00. If they get to bed faster, they’ll have more time to read. When they are around age 6, I have often said, “read in bed as late as you want.” They are excited they get to “stay up,” so they push themselves in their reading ability, and then fall asleep. When trying to lose weight or even maintain health, it makes sense to count the calories and make the calories count. Wasted calories of cookies and chips turn to “waisted” calories, with zero nutritional gain. It is easier to turn to the fruits and veggies if they are the most easily accessed items in the kitchen. On the contrary, it is more difficult to get to the chips and cookies if they are not even in the house. It seems to me that we parents have a responsibility to limit the “electronic diet” of children. Video games, movies and television are like chips and cookies. They take up the calories (hours spent), without yielding nutritional gain. We are far from perfect. Limiting electronics has been difficult, and continues to be. Reading requires a higher degree of mental participation than watching a movie, listening to music or playing a video game, so it meets resistance. But you are the mom! You can do it! With new babies, you can start fresh – read aloud; avoid buying electronics. But for those who have been more in the electronics world, it will take more discipline to make the shift. Rome was not built in a day. – Maybe start with 15 minutes one day each week of popcorn & reading time. Then make it longer, or add another day. Set a goal for which to aim: 1hour/day? 3 hours/day? 3 hours/week? You are the parent. – Have a daily limit on electronics with or without required reading. Again, have a goal and start toward it with increments that make sense for your family. 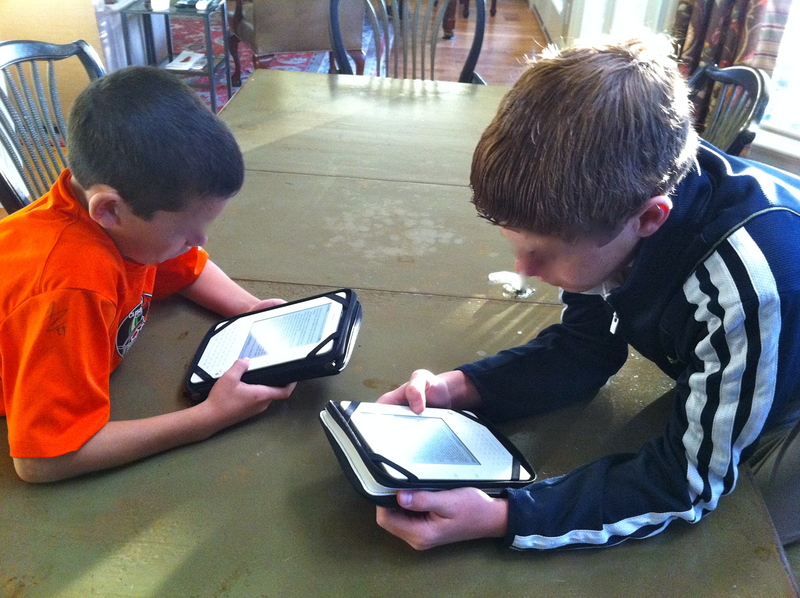 One note: I went through a time when I rewarded them with video game time for reading. Rewarding them with 15 minutes of “educational computer play” time for every 30 minutes of reading did two things, according to Dr. James Dobson: 1. It labeled reading the chore and computers the fun. 2. It was as though I was saying, “If I eat two salads, I get a dessert” – counter-productive in anyone’s calorie counting. So we separated the electronic game time, and decided to allow it one day/week. Every so often, I come across something like a math program on the computer that would really help school. I try not to throw this baby out with the electronics’ bath water. But if the electronics (even the educational) adversely affect the reading time, then we adjust. Finally, I find myself being the “mom taxi” throughout the evenings, going from soccer practice to music lessons, etc. Sometimes, we have talked about everything there is to discuss, and we are still driving- or waiting to drive some more! As a child, I was never able to read in the car due to motion sickness, but my children use this time so productively. Book lights have been a blessing, and if queasiness happens, they take a break with eyes closed. It’s no excuse to turn on the DVD player hanging from the ceiling. Tomorrow’s leaders are today’s readers. Let’s raise them together, girlfriend!! This entry was posted in Motherhood, Personal Growth, Sister to Sister, Uncategorized and tagged children, Family, homeschool, kids, Literature, Parenting, Reading, teaching by Terri. Bookmark the permalink. Wow Terri, that was awesome! Thank you so much for going through all the details for raising readers! I can’t believe some those stats ~ craziness! Though we have some of this, there is ALOT of room for improvement. We are so doing this!!! Thank you once again for showing the way:) God Bless! The CD came down in the LIFE subscription for December and is called, “Developing Kids Who Love to Read.” It is also available in the Parenting Pack. Hope that helps! Thank you for sharing your insights! My wife and I don’t have children yet, but we want to be as prepared as possible. I never read much as a child, but over the last few years it has developed into a passion! I don’t even own a TV these days and I can say that I don’t miss it and that I am hopefully a better person because of it. I just had to comment on your “100 Easy Lessons”. My oldest went right through that in kindergarten and was into Dr. Seuss type books by the end of that year. My second, we tried it in kindergarten and gave up. We tried in first grade and gave up. We tried in second grade and finally got him through phonics and slowly it started coming together (of course he taught himself how to “carry” numbers in addition in kindergarten!). By 3rd grade, he started out the year with the “regular” readers and was doing the “advanced” readers by October. Now in 4th grade, he flies through books taking one in the car any time we are running! My third child is 4-1/2 and already completed all the Get Ready, Get Set, and Go for the Code of the Explode the Code series, and now she is doing the 100 Easy lessons on a two per day pace. How wonderful and how different they all are! Just hang in there and encourage them and they WILL learn! I am so thankful for the freedom to homeschool where my child was not labeled “slow” for not learning certain skills when everyone else was – he was just busy learning skills in other areas at that time. TOTALLY right on! Thanks for sharing these tips with today’s parenting generation. As a grandma of 7, I’m passing it on to my kids who still have their kids at home. Thank you Terri for this post and underlining the importance of reading. I love to read, my husband falls asleep on the first line and puts effort to read, my youngest daughter will take up a book when she thinks of it and our eldest daughter likes the idea of reading, carries a book in her purse but doesn’t take the time to read. Help! I am very excited to implement many new ideas you’ve recommended! Especially the family reading night! How fun it will be to read and discuss books with the children! The one thing we have done — and I agree — has made the biggest impact on our children’s love for reading, is limit their electronic diet. Television & video games are not a battle because we do not have them. However, our situation is unique because we do not even have all our children most of the time (I have two step-sons, 9 & 8 yrs old). When they are not with us, they have no electronic diet guidelines. Nonetheless, they both still love to read! (and asked for books for Christmas :)) Caleb is rarely promted to read and will sometimes finish a book front to back after he comes home from school. Again, thank you for such a detailed post on such an important topic! Amazing! I love love love giving books for gifts! Your ideas are fantastic and I am going to share this article with all my Facebook moms..thanks. My son will be 33 yrs old in January and I still have his books that he had received since birth! 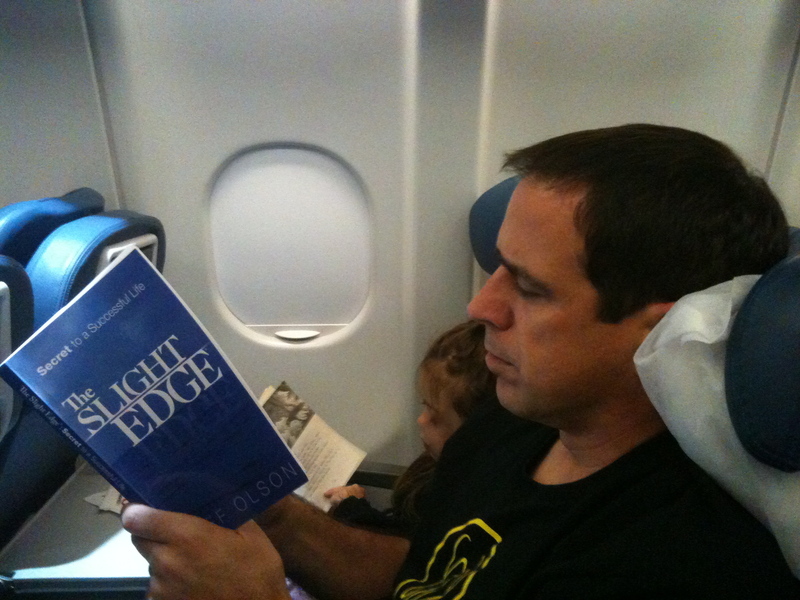 I have passed many on to his children as well…reading is such a privilege! Your articles are so real life and I appreciate you sharing! Thank you again, Terri. Your info is so helpful to me, even just to reassure me that I’m not an extremist! Merry Christmas! Great, and I mean GREAT insights Terri! I read in a book (I believe it was Influencers) that the #1 reason children read is not because their parents read to them, but because they see their parents reading. Woah. Thanku so much for the blog plus the CD. Wow…how intresting, I used Teaching Your Child to Read in 100 Easy Lessons too. The son in 5th grade picks up the books coming thru the system n devours them, 2nd son reminds me of the son you talked about that that the book eneded up being the 200 lessons,so thanku for the encouragement to keep on n I sure he’ll soon be readying the system books too. Blesssings to you all. Thank you so much for all your advice and suggestions about reading. My 14 month old loves to read with me thanks to all I have learned with Life Leadership. However, I am very curious of your opinion on how many books we should own or read in one sitting. I recently was exposed to the idea that “less is more” in regards to how many books we have accessible and how many books we read to our little ones at one time. The idea is that it might be better to read 1-2 books and then re-read the same book multiple times within that reading session or even in that day instead of trying to get through a stack of books in one day. I would love to hear your thoughts. I definitely don’t want to increase a short attention span due to offering too much for his little brain. Thanks for reading- both my blog and the books to your kids!! You are raising future leaders! With that in mind, however, I believe personally that reading the same book many times to toddlers is not only necessary but more enjoyable and educational!! I just imagine learning a new language (like Italian!) and reading a small book with a few words. The next thing I would want to do is read it again and again until I had mastered the words. Maybe that is true in young kids- they want to read it again and again and master the story. My kids had many books memorized, they loved reading the same one so much! At the young ages, let them be your guides. My children -especially until age 5 or so- wanted to read the same books over and over. Once they began reading on their own, they ventured further. Now, my 16-yr-old was reading an old book the other day, because his 11-yr-old brother had just read it and it brought back good memories, so the older one re-read it. Ha! Thanks for reading and re-reading. You sound like a mother of excellence:)! !